What if when you streamed free music, you knew the artist would get paid fairly, directly, and instantly… every time? What if you could even tip them by simply clapping your hands or pressing a button? ROTTERDAM and HONG KONG, 1o January 2018​: Today, the Musicoin Project and ROCKI announce the development of Volareo, the world’s first “smart” speaker powered by blockchain technology. Volareo allows users to listen to a lifetime of free music while providing instant compensation to musicians. 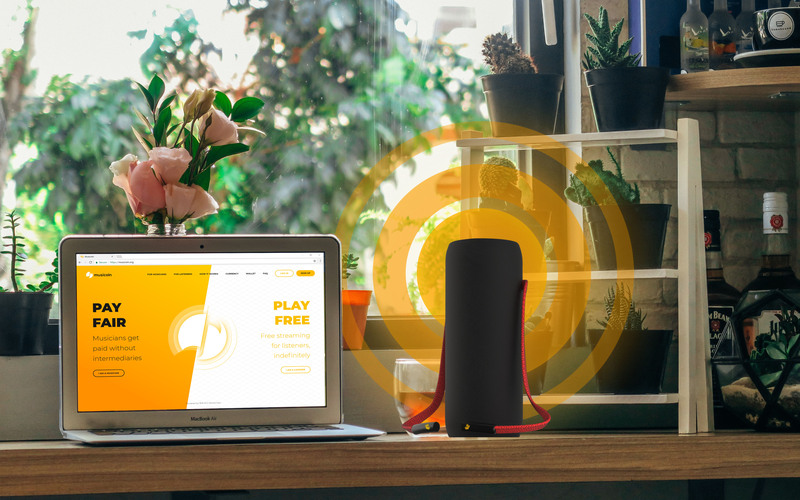 Harnessing the Musicoin blockchain, the Volareo smart speaker honors creativity with royalties that make today’s popular streaming services seem downright stingy (Musicoin currently issues $.10 USD per play at the time of this writing.) Volareo allows music fans to further engage their favorite artists by tipping various amounts of Musicoin simply by clapping their hands or pressing a button on a mobile app. Musicoin’s online platform is live at musicoin.org, with over 2,500 artists already signed up. Right out the box, Volareo will be ready to tip musicians. Each device is assigned a unique wallet address pre-loaded with $10 worth of Musicoin. ROCKI and Musicoin aim to deliver Volareo by the end of 2018, and will invite musicians to co-brand the product and share with their fans. To follow the progress of Volareo, sign up on on www.volareo.live and join the community at www.musicoin.org. Please contact press@musicoin.org or press@volareo.live for media inquiries.